The Pontec PondoSolar 1600 is a solar powered fountain set for garden ponds. This complete fountain kit is ideal for situations where an electrical supply is unavailable. The Pontec PondoSolar 1600 fountain set is simple to install and costs nothing to run, using only solar energy. The 12-20 volt, 1600 litre per hour solar fountain pump is supplied with 3 different fountain nozzles which produce different water patterns including multi-jet spray nozzle, single jet fountain and water bell nozzle. Also supplied are 3 push-fit nozzle extension pieces with can be added or removed to alter the distance between the pump and the nozzle. At full output this solar feature will produce a fountain jet reaching up to 180cm high. 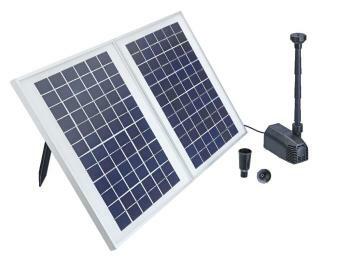 The set is supplied with 2 x 10 watt solar panels, each with supporting poles and ground spikes that allow the solar panels to free stand in locations that receive good sunlight exposure. The solar panels can be separated and installed in different areas to receive sunlight at different times of the day. 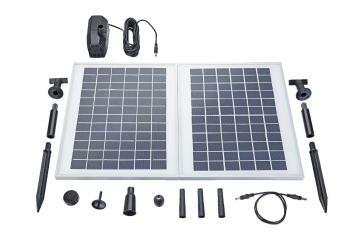 The pump plugs directly into the twin 10 watt solar panels via a low voltage cable. The PondoSolar 1600 Fountain Pump Set works on direct solar connection and will operate only when conditions are favourable. 12-20 volt DC, 1600 litre per hour (355 gallon per hour) solar fountain pump. 2 x 10 watt solar panels. Fountain height of 1.8 metres (5.9 feet) with Vulkan spray fountain nozzle.